Common throughout Britain though rarely seen, moles (Talpa europaea) spend most of their lives in a series of tunnels, only the familiar molehills above ground giving them away. While their activity can be unsightly in gardens, for race-courses and playing fields it may be a positive danger – a hoof or foot twisted in a mole-hole can lead to serious injury. The damage that moles do is incidental as they burrow in search of food – earthworms, insect larvae and slugs – and occurs throughout the year, though it may be more noticeable in warmer and wetter weather. Moles are highly territorial creatures – solitary outside of the breeding season – and a single individual’s network of tunnels sometimes covers as much as four acres. This inevitably means that, rather like the human housing market, competition for prime locations is strong; several young are born each spring, leaving home within a couple of months of birth to establish their own territories. Ridding yourself of one resident mole is no guarantee that another will not appear to take its place; sometimes it may be worth considering whether the molehills can simply be tolerated. Various approaches have been tried over the years to repel moles, with varying degrees of success. Traditional methods include putting prickly vegetation – holly leaves or bramble cuttings, for example – or moth balls, creosote or any one of a number of other strong smelling substances within the tunnels. Another method involves part-burying a number of bottles, so that when the wind blows over their tops, the noise below ground upsets the moles and they will move away to somewhere more peaceful. A variation on this theme uses the familiar toy windmill. Sticking a few of these, it is said, into the ground – or in the necks of buried bottles – will soon send Mr Mole packing. A range of modern repellent devices are also available for sale. Some types are supposed to interfere with the Earth’s magnetic field and, thus, the mole’s ability to find its way around; others apply the increasingly popular principle of ultrasonics to the problem. This solar powered unit is mounted on a spike driven into the ground and emits a pulse of ultrasound every 30 seconds, designed to protect up to 650 square metres. It is always difficult to be absolutely certain what contribution any deterrent device makes – you can never know how things might have been if you had not used one. In the end, if the problem goes away, it probably does not much matter, particularly since modern methods are not very expensive – and traditional ones are virtually free. In addition, if they do succeed in making the area “undesirable”, then there is little likelihood of another mole taking up residence soon after the first one leaves. Until recently, mole smokes were available for the gardener to use. Looking rather like small fireworks, they were placed into the runs, lit and then covered, their noxious fumes killing or driving the mole away. With these no longer on sale, today chemical control is a job for the fully trained and certificated professional. Although often seen as very old-fashioned, trapping is one of the cheapest methods of control, a variety of traps being sold for a few pounds at garden centres and hardware shops. There are two basic types – those designed to kill and those intended to catch the mole alive. Although for many the idea of not harming the mole has enormous appeal, there is some controversy over how humane live traps really are, with some people finding that the moles die anyway, either from shock or starvation – though checking regularly can help avoid this. In addition, although releasing a mole where it will no longer be a nuisance might seem a good idea, in practice because they are so fiercely territorial and aggressive amongst themselves, it is not clear if this is as kind as it first appears. There is a definite art to mole trapping; it can be very effective when done by an expert and a bit of a hit-and-miss affair otherwise. If you do decide to do it yourself, whichever type of trap you choose, handle it with gloves to avoid leaving your scent on it, set it in accordance with the instructions and place it carefully within one of the tunnels. Then it is just a case of waiting and checking until your mole is caught – though you may have to repeat the operation even if you are successful, at regular intervals to deal with any new arrivals. 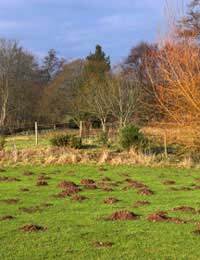 While a ruined lawn is never a good sight, even the most passionate green keeper would have to concede that when Mr Mole does become a pest, the crime is not deliberate; he is really only guilty of being where he is not wanted.